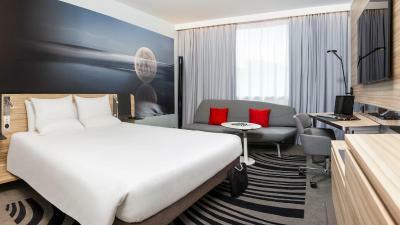 Lock in a great price for Novotel London City South – rated 8.6 by recent guests! The Breakfast here is AMAZING! We would fill up on breakfast and it would keep us full until around 3 PM! Eggs, toast, sausage, bacon, pancakes, muffins, coffee, tea, juice, cheese, yogurt, cereal.... the list goes on! The staff were always so kind and we loved that they really tried to make us as comfortable as possible! We were able to keep our luggage there until check in which was a life saver, and our room fit the 3 of us nicely. My husband and son are very tall (over 6 feet) and fit in the beds. The couch can turn into a double bed and so my son was quite comfortable. 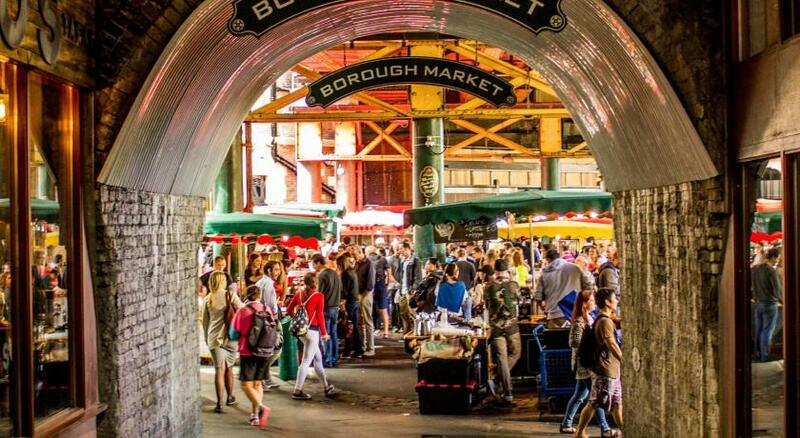 The internet worked great, right next to Borough Market and easy walk to the Tube station. We have made some friends for life! 5 stars! The breakfast was tasty and the variety was satisfactory. The location was great - a couple of minutes walk to the closest underground station. We have stayed at this hotel many times, as the location is very convenient for London weekend breaks. 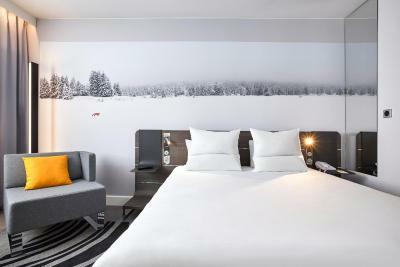 The rooms are smart, clean and comfortable. I like the rooms comfortable very nice space. The bed are very soft. Pillows were very comfortable and the shower was really good. 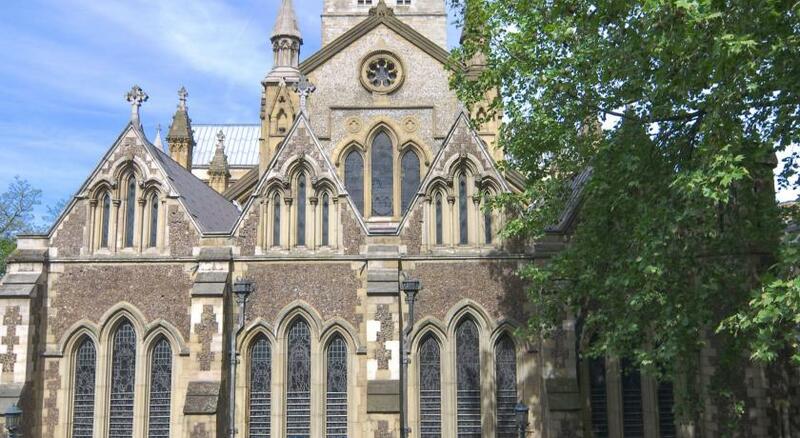 Location is good since its very close to borough market and walking distance to london bridge and tower bridge. People are so friendly and helpful. The receiving staff of the breakfast was so accommodating. The staff was nice. They only provided us 1 pair of bathrobe and slippers, while we booked a room for three people. They brought it right up when we asked. The property was very clean and had an excellent breakfast layout. I enjoyed the location being central to all of the sites. 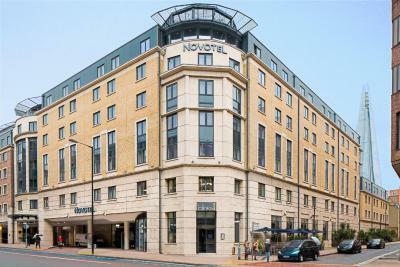 Novotel London City South This rating is a reflection of how the property compares to the industry standard when it comes to price, facilities and services available. It's based on a self-evaluation by the property. Use this rating to help choose your stay! 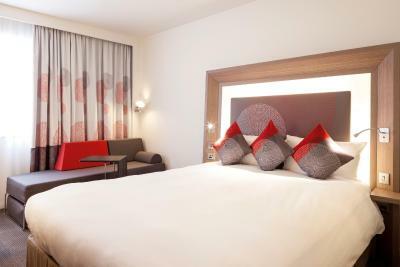 Centrally-located in London, Novotel London City South has a rooftop leisure suite with a gym, sauna and steam room. 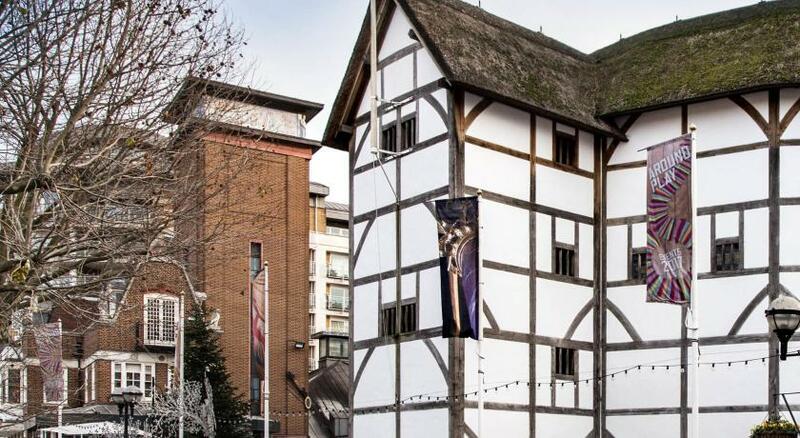 Guests are 5 minutes’ walk from Shakespeare's Globe Theater and the Tate Modern. 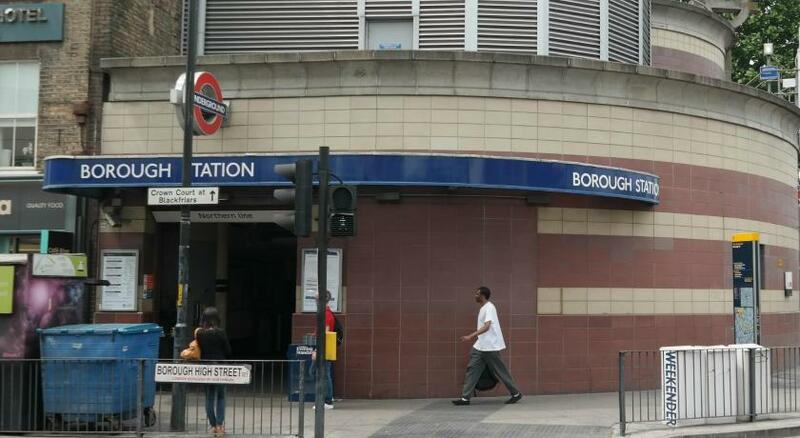 London Bridge Station is 2,300 feet away, for easy Tube access to the West End. The London Eye and St. Paul's Cathedral are a 5-minute taxi ride or a short Tube journey away. 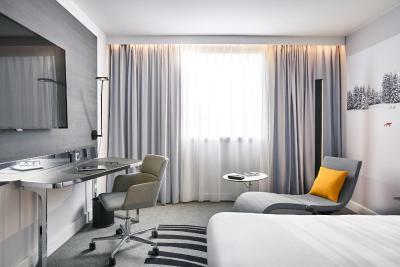 The stylish bedrooms at the Novotel London City South each feature a satellite LCD TV, air cooling, sound proofing and a luxury private bathroom. Elements restaurant serves international cuisine, with 24-hour room service. Clinks Bar has areas for working and relaxing, with bright decor and Wi-Fi. 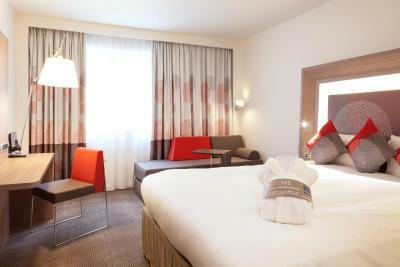 When would you like to stay at Novotel London City South? This stylish bedroom features a satellite LCD TV, air conditioning, soundproofing and a luxury private bathroom. Nespresso coffee machine, iPod dock, large work area. Free: internet, local telephone calls, bottled water. 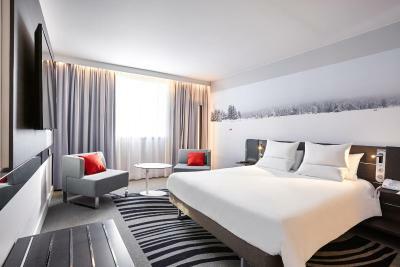 This stylish and soundproof room features a satellite LCD TV, air cooling, free Wi-Fi, and a luxury private bathroom. This double room features a sofa, soundproofing and electric kettle. Hotel surroundings – This neighborhood is a great choice for travelers interested in tourist attractions, city walks and monuments – Check location Great location - show map Guests loved walking around the neighborhood! 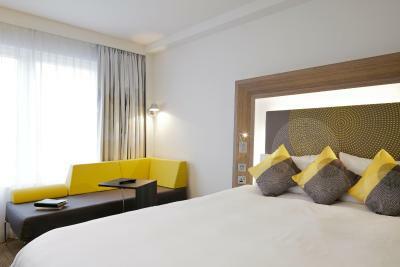 House Rules Novotel London City South takes special requests – add in the next step! 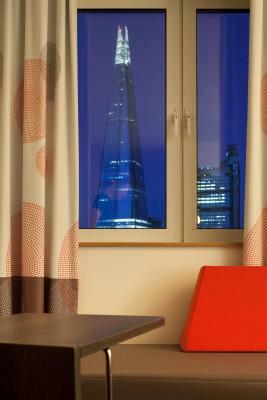 Novotel London City South accepts these cards and reserves the right to temporarily hold an amount prior to arrival. The property's reception area is currently undergoing refurbishment. Guests should not be affected by the refurbishment works, but please contact the property for further details. 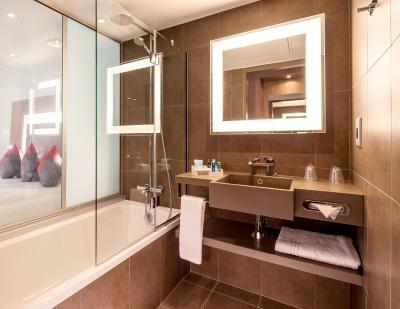 The toilet and the shower were nearly an integral part of the room separated by only semi-mirror doors. It could be cool if you travel alone or maybe as a couple but with family, it is challenging. The location, the room facilities and all the people in the hotel were above expectations. The view from the room was superb but I think most of the rooms have less panorama. The only thing that I didn't really like is that there really wasn't a ton of privacy when it came to the bathroom. I liked that the glass shower window changed to make it hard to see through. The door didn't lock, but with our family wasn't a big deal. I liked that the buses that we took to get around the city were no more then a 15 minute walk. The staff was really nice. We enjoyed the food and the breakfast was delicious. Air conditioning system makes some noise even when switched off, which is a bit annoying by night. Besides all the criteria above, the Nespresso machine in our room. All was to standard as expected so disappointment to write on this review. Location was excellent to our places of visit, we did not eat in hotel as we had meals at restaurants elsewhere. Excellent breakfast. 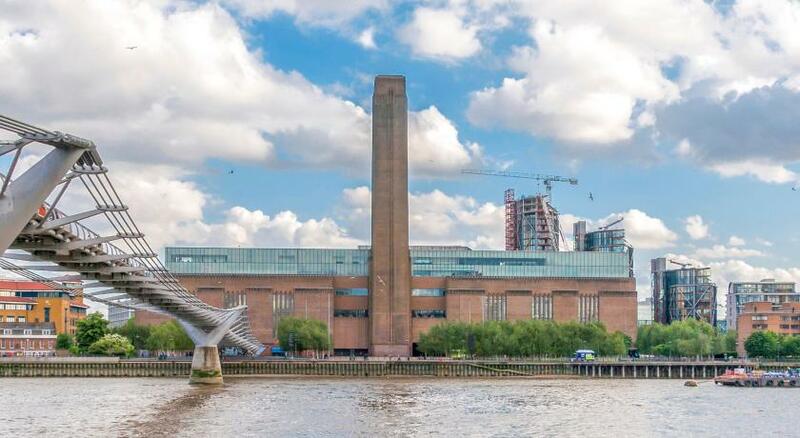 Great location for visiting the Shard. Nice & quiet. Friendly staff. Bar staff not very attentive. Room service portion size laughable. Expensive. 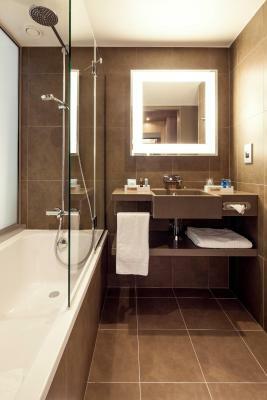 Cleanliness and room design. Comfort. 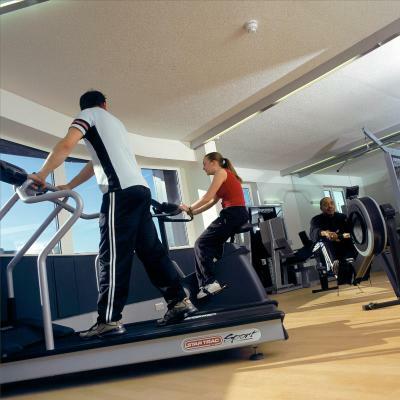 Fitness room and steam/sauna. I initially went to the wrong hotel ... too many Novotels in the same area. It was my own fault most probably. 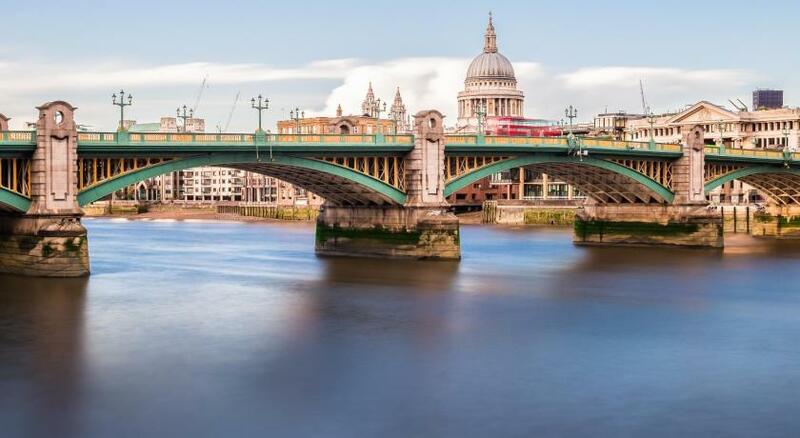 great location for city of london, even though you are on the other side of the river. easy walk over the bridge and you are at cannon street! nice spaceous room, good bed, tv, bathroom was clean. it was a short stay - there for 12 hours or even less. The staff were super friendly, rooms were lovely and clean and breakfast was superb!! Good location, all staffs were very friendly, it was very good to store our luggages.